Each one of us has the personal power to cause positive change. That power resides not in the collective, but in the individual. That means you. Yes, you. You have the power. Not them. “MEN GO crazy in congregations, they only get better one by one.” That’s a line out of a song — the song All This Time, by Sting. I’ve used it as a quote on my email signature for some time. Recently, one of my clients asked me what I meant by including it. It refers to personal power, I wanted to say. The power that individuals have to transform and develop themselves. It always starts there, and seldom, if ever with the collective. The collective usually operates according to the rules of insanity. Instead I stumbled over my words. I found it difficult to provide him with a pithy “elevator pitch” response. On the one hand that’s OK. We don’t want to be spitting out catch phrases like we’re some angry radical, do we? On the other, I realised that what I’ve felt intuitively to be true needed to be backed up with a strong and succinct argument — and perhaps some data. So I did some research and this is the result. We know this from when people get together to socialise and drink alcohol. If there’s one person who doesn’t want to, the rest will cajole him or her into drinking. It’s as though there’s something wrong with them for wanting to exercise their personal power, instead of conforming to the destructive actions of the group. That’s an obvious example, but let’s turn it around. Let’s look at a group of people who take a moral stand against alcohol, because of the damage it does. If somebody — whether inside their group or outside — dares to drink, well, you know where that can go: it can develop into judgement, then anger, vitriol and hatred, against anyone who drinks. Of course, the perpetrators of this anger will not recognise their own madness. They’ll be blinded by their self-righteous red mist. Perhaps alcohol isn’t the best example, but I’m sure you can find some of your own. There is plenty of hate on social media right now and a good 50% of it is by people who believe they’re on the “right” side of the argument (which is usually designated as the “left”). The content of the argument is not the point. The point is what happens to people when they get swept up by a collective mindset — any collective mindset. Here’s another George Carlin quote that furthers this point: “People are wonderful. I love individuals, I hate groups of people. I hate a group of people with a ‘common purpose’. ‘Cause pretty soon they have little hats. And armbands, and fight songs, and a list of people they’re going to visit at 3am. So, I dislike and despise groups of people but I love individuals. Every person you look at; you can see the universe in their eyes, if you’re really looking.” Perhaps he weakens his point by “hating” so much, but the general argument is valid. As further evidence for this notion, look at the wars that have been — and still are — fought in the name of religion, by people who believe they are “right”. You can be sure that the people upon whose teachings those religions are based had something else entirely in mind. It certainly feels that way when you take a stand against a collective mentality. Perhaps we’re primed to believe others more than ourselves, or at least to doubt our own personal power, when enough people agree on something. Perhaps we’re primed to feel stupid in the face of collective consensus. Even if that consensus is insane. One area where this phenomenon has become a major problem is in the junction between the profit imperative of the corporate world, and individual conscience. This is best illustrated by the 2003 movie The Corporation, which assesses modern corporate business practices against the diagnostic criteria for a psychopath according to psychiatry’s DSM-IV standard. The film presents a strong case that corporations — and therefore the individuals that make up those corporations — are systematically compelled to behave like psychopaths: callous disregard for the feelings of other people; incapacity to maintain human relationships; reckless disregard for the safety of others; deceitfulness (continual lying to deceive for profit); incapacity to experience guilt; and failure to conform to social norms and respect the law. You can look at this phenomenon in the context, not only of corporate voracity, but also of government corruption. To put a stop to things, and make a difference, always requires an individual to exercise their personal power. To stand up and say, “Enough!” That’s never going to come from the collective. In the same way that the psychopath won’t admit any fault, the collective will not either. The collective, by this measure, is insane, and seeks to perpetuate its own insanity. Of course, being psychopathic, if you’re the one who stands up it will gaslight you into thinking you’re the one who’s insane, or stupid. In South Africa right now, there is rampant corruption. It took a handful of individuals — Mcebisi Jonas, Vytjie Mentor, Makhosi Khoza — to stand up to it. Their actions split the collective, and some followed, but slowly and reluctantly. And not before the collective had rounded on Makhosi Khoza, in particular. Typical to these scenarios, it became about “the way she went about it”. How often have you heard that phrase? The collective always pulls it out the drawer when it doesn’t like what someones says. Who’s the one with “the problem”? We see this in family systems and friendship groups too. The individual who seeks to do things their own way becomes the “identified patient“, the one “with a problem”. The more that person tries to assert their personal power, the more their actions are taken as further evidence of the problem. It’s often these individuals who present themselves for therapy or coaching. Incidentally, that very action on their part is often the indicator that they’re the sane ones, because they’re willing to take a look at themselves. The ones who refuse to are often the ones with “the problem”. Similarly, you often get the boss asking a coach to come and “fix my team”. Hmm. This phenomenon also shows up in team versus individual coaching. People feel massively constrained in a team context and seldom say the things that they would in an individual session. The level of depth and authenticity that happens in an individual session is generally much greater. The difference happens in a team context when one individual — again, it’s the individual — really opens up and shares and shows a willingness to go deep. That usually sparks something. If it’s the leader who does that, even better. If no individual does, then the group won’t and the result will be a superficial one. There’s another quote to consider here. It’s by the father of the modern consciousness movement, G.I. Gurdjieff. He said, “Consciousness cannot evolve unconsciously.”.In other words, it requires deliberate awareness and intent for a person or a group to evolve. It seems that such deliberate awareness and intent is a power that belongs to an individual, rather than to a group. As soon as a group gets hold of an idea, it turns it into a religion. It sets up an arsenal of rules, of rights and wrongs, and goods and bads. It hurls those like grenades at its members and the world, and runs away with itself. The individual once again gets lost and sublimates his or her personal power to the collective will. In the Practical Mindfulness program we teach people how to “maintain the balance of your mind” and how to do that by treating every situation on its own unique merits, rather than by throwing a set of rules at it. To do that, you need to know yourself, to surrender your fear of the collective, among other things, and be able to answer to yourself. To allow that in others you have to be able to not judge them. That often means not getting lost in the collective mindset. So here we come to my “elevator pitch” answer: Positive change is always initiated by an individual answering to his or her own intuition or conscience, and then acting on it. It seldom, if ever, emanates from the group. Groups tend to resist change, and just do more of whatever they’re already doing, which is usually insane. Looking for a living example of this, I realised that Gandhi is perhaps the paragon of this principle. 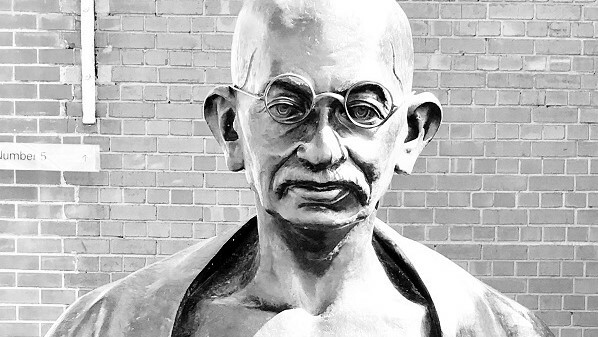 When he performed his Salt March, he stood alone against the might of the British Empire — and won. The noteworthy aspect of his action was that he did not start a movement. He did not tell anyone else what to do. He simply walked down to the ocean himself and gathered salt — an individual action. Rosa Parks did the same. She took a seat designated for whites on a bus in Montgomery, Alabama. Finally, that brings us back to Sting. And hopefully, now, the point is clear. Men go crazy in congregations, they only get better one by one.